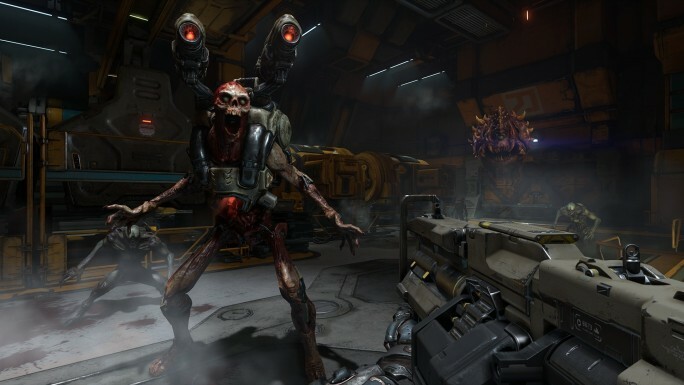 Finally, after being teased on the cases of countless copies of 2014’s Wolfenstein: The New Order, the closed multiplayer beta for the new DOOM is here. It’s nearly over now but is running for the rest of today, so if you have an old beta code and haven’t yet jumped in there is still time! But anyway, I imagine what you all want to know is what the actual game is like now that we can finally get our hands on it? Or, at least, a small part of it. Well, after playing a couple of hours of it yesterday, I can confidently say I had quite a bit of fun with it, once I got over some initial hurdles. Seriously, no one has released a game like this in a very long time. An artist’s impression of me after a couple of rounds. First things first: DOOM is fast, and that was apparent from the moment I started playing. I joined a match, spawned in and upon tilting the left joystick forward my character zoomed off so quickly I thought I was playing the game on fast-forward. It was incredibly jarring after playing so many years’ worth of slower, cover-based shooters, as well as initially very frustrating as I often found myself ploughing into enemy gunfire before I even had time to register what was going on. And the same goes for my opponents, who could come running around the corner at any moment to ruin my day with a rocket to the face. Fans of classic arena shooters such as Unreal Tournament will be familiar with this type of gameplay, where being light on your feet and familiar with your particular weapon’s strengths is key. And I very soon became a fan of this style after I spent a few rounds adjusting to it. It may be frustratingly easy to die initially, but is incredibly satisfying once you have you have a grip on quickly traversing the environment to out manoeuvre your opponents. The only aspect of the movement that bothers me is that there are only two speeds of movement: full pelt or barely even crawling. I was playing on a PS4, and when I had the left joystick pressed all the way forward I was zooming along like Sonic the Hedgehog on speed. If I so much as pulled the joystick back a little, my character ran like Usain Bolt, only when he was six months old and had cement blocks strapped to his feet. There is no in-between, which I suppose there doesn’t need to be, but if the game could register me as running without grinding the joystick against the plastic that would be nice. His head is in pieces, so this still counts as a headshot right? There is a surprising variety of weapons in the beta, and once I found a combination I liked I was piling up some really satisfying kill streaks. 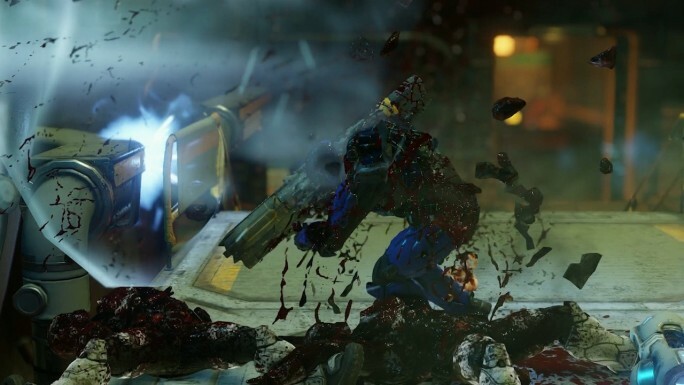 My combo of choice was the Vortex Rifle (a medium damage, long-range sniper rifle) and the classic DOOM Super Shotgun (super high damage with spread-fire). This way I could run into the open areas and take pot shots across the room before switching weapons and zipping into the corridors, ready to blast unsuspecting opponents in the face. I know that might not sound like the most adventurous of weapons choices, but they worked for me given the game’s “never-stop-moving” mentality. The other alternatives provide some great strategies, especially when you factor in that each weapon has a secondary mode. The Rocket Launcher, for example, has a secondary ability to remote detonate rockets in mid-air, so if you miss your shot you can still damage your foe as the rocket flies past them. The Vortex Rifle can charge a zoomed, higher damage shot by holding down the left trigger. Although some weapons had a fairly lacklustre secondary fire, such as the Super Shotgun only granting a mild decrease in its bullet spread, there’s enough to experiment with to create some cool ways to kill opponents. The other major kind of weapon in the game are Demon Runes, which spawn at random intervals and allow a single player to become a demon for a time, or until they’re killed in which case another player can take up the mantle for the remaining duration. Only one type of demon is available in the beta, the Revenant, and it is essentially a skeleton with two rocket launchers and a jetpack. While it certainly packs a punch (almost one-hit-kills), I found the Revenant to be quite well balanced since it isn’t dauntingly hard to kill, particularly if a team concentrates its fire on it. Nabbing a demon rune is a great way to gain some kills for a player who’s suffering some losses without it being a complete “I win” card. Although it does have its own “na na, na-na na naaaaaa!” dance. A feature I didn’t notice at first while getting used to the game but came to really like is the Hacking Modules. These are similar to the killstreak/deathstreak rewards from Call of Duty, only they can be activated before you respawn instead of having to wait for a kill/death succession. They also can only be used for a certain duration in the entire match, so each time you die and swap Modules the timer pauses and starts up again when you re-equip it. So upon any respawn I could use Modules to track the person who killed me, be directed to the nearest power up or see the health bars of enemy players. Each one created tactical options, particularly the latter as seeing an opponent’s health status was very handy when it came to choosing who to shoot in a pinch, and with what weapons. There’s more I could go into, but those were the most prevalent aspects that stood out to me in my brief time with DOOM. It’s a fast-paced multiplayer shooter that doesn’t require team-chat tactics for it to be fun; you can just kick back and have a leisurely play. We’ll have to wait for the full game to drop before we can see if the rest of the features are like what we’ve seen here, such as whether the other Demon Runes are just as balanced or if other Hacking Modules give too much of an advantage. 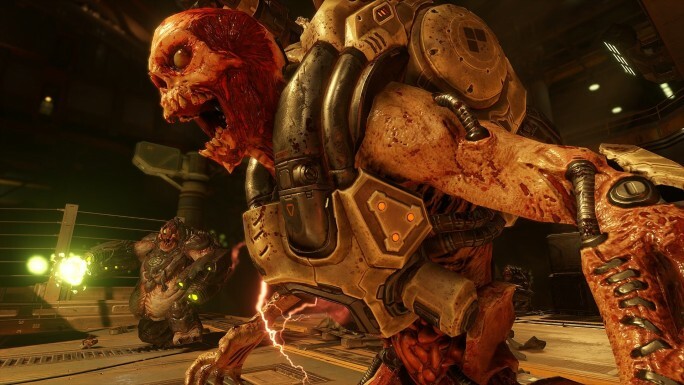 DOOM releases on May 13 for Playstation 4, Xbox One and PC. Follow Tom to hell on Twitter: @tomdheath. For more gaming news, follow LoadScreen on Twitter,@load_screen, and like on Facebook.